CW Fundraiser - We're Coming Out! 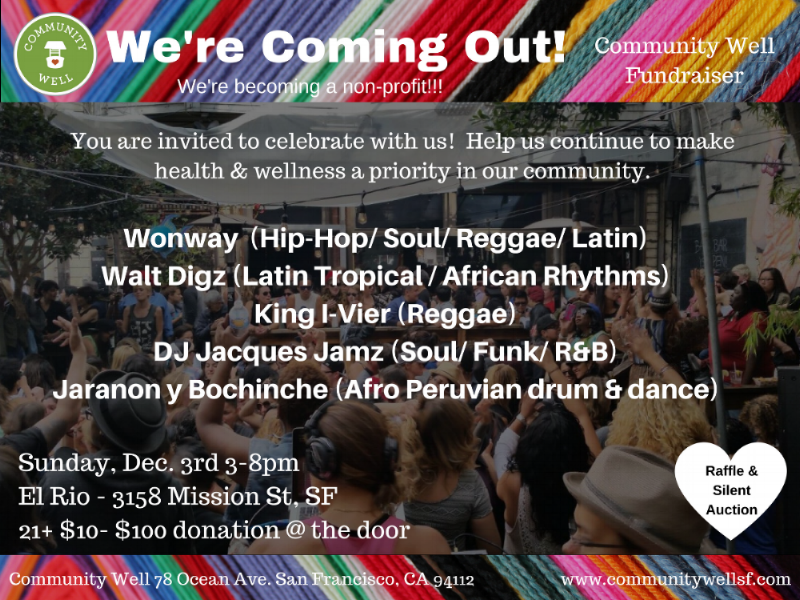 Community Well is now transitioning into a fiscally sponsored project of the Social Good organization and will have a “Coming Out” Fundraiser on Sunday, December 3rd from 3-8 PM at El Rio 3158 Mission Street in San Francisco. In honor of this exciting new development, and in order to raise the baseline funds needed to become a nonprofit, we are holding our fundraiser at El Rio where we will have several great DJs donating sets, a raffle and silent auction, and, of course, amazing company and fellow conspirators. We hope you will join us and share this announcement with your networks so we can be sure to pack El Rio! The decision to become a nonprofit was in made in hopes of creating a more sustainable business model and to allow us to fundraise for much-needed costs; as well as to expand the health and wellness services currently offered. In this historical moment, the services at Community Well are needed more than ever, and we are feeling increased urgency to provide access to these services to the community. Don't worry if you can't make it; you can still support us by donating HERE! Information about the Raffle Prizes, Silent Auction, Food & Child Watch below. Don't let these Raffle Prizes pass you by! 1) 3-Day stay in a Big Guerneville Home + $60 gift certificate to Seaside Metal Seafood Restaurant. $1,260 Value. So what do you get? Plenty of Space, Central to Everything Guerneville, Central Heat & Air, 2 Fireplaces, Hot Tub, Fenced Yard, Sunny Decks; Flat Walk to Downtown Guerneville, River Beaches; Short Drive to Golf, Wine Tasting, Hiking, Coast. WIFI. Keyless Entry. AND your Well-Behaved Dog is Welcome! View pictures HERE. 2) Family Portrait Photography Session by Julia Peterson. $350 Value. Within San Francisco, up to 6 people in the shoot, 30 minutes and includes 20 edited images delivered in color and black and white. Smile! 3) Kabuki Springs Spa Package. $200 Value. Their most comforting treatment, relax in a traditional Japanese furo tub with their signature matcha (green tea) bath. This aromatic bath is followed by a 110-minute Swedish massage. Yes, please! Raffle tickets will be sold until December 16th at the Winter Artist Market and Raffle Winners will be drawn that evening. Silent Auction items are now live HERE! Our online auction will be accepting bids until Sunday, December 3 at 12pm, when it transitions to a live auction at our “Coming Out” as a Non-Profit Party at El Rio. Make sure to come hungry this Sunday for some yummy eats between dancing & cocktails. PARENTS, we'll have Child Watch! We will have name tags & some bright identifying gear, i.e. light vests, to easily identify our kids & may use a “buddy check” system if appropriate. We adult caregivers will have walkie talkies & we will request 2 contact #’s from parents/caregivers in case of an emergency. We will provide standard snacks, no nuts or chocolate, but we need to know if your child/ children are allergic to anything, i.e. gluten, or if they have special diet restrictions. Suellen Lee has over 10 years of working with children as an educator (grades 1-8), camp counselor, & therapist. She is also the mom of three young boys who are in preschool & elementary school. Emma Louis-Dreyfus is an LCSW (clinical social worker) & family therapist with over 20 years of experience in the field. Emma has worked with populations & in contexts spanning residential treatment, foster & group home therapy, school-based counseling, & currently early intervention for families with young children.